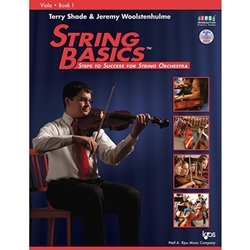 String Basics: Steps to Success for String Orchestra is a comprehensive method for beginning string classes. Utilizing technical exercises, music from around the world, classical themes by the masters, and original compositions, students will learn to play their string instruments in an orchestra. Step-by-step sequences of instruction will prove invaluable as students learn to hold their instrument and bow, finger new notes, count different rhythms, read music notation, and more.